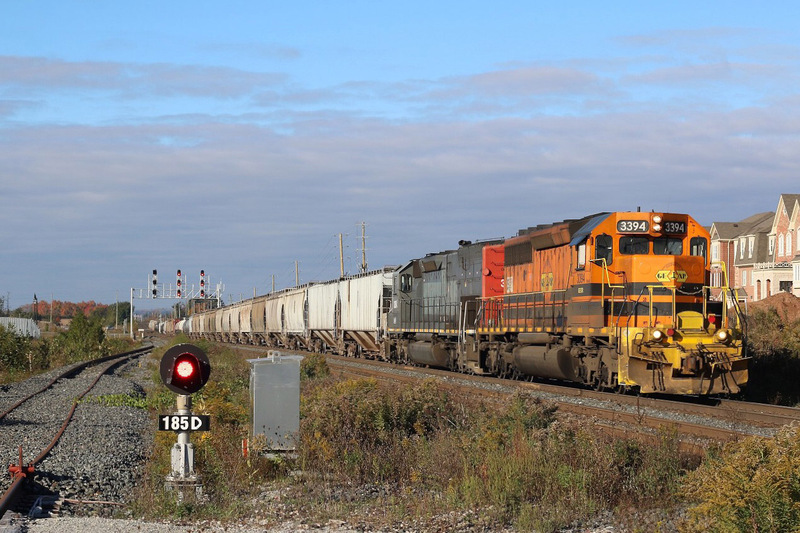 Railpictures.ca - Marcus W Stevens Photo: The cold autumn wind is blowing hard, while in the distance the orange autumn colours are gradually being stripped off the trees, this though is not the only fading orange shades, as Goderich-Exeter road train rolls east past the GO Station at Mount Pleasant, with little over a month left, GW orange will be all but a memory here soon too. This is one location I haven’t spent much time at over the years, but it offers a bit of a change of scenery as the train leaves the Halton Hills behind and enters the urban sprawl of Brampton. the signal beside me for now basically serves no purpose with a temporary stopper installed on the tracks, but in the future the third track will eventually reach all the way to Georgetown. | Railpictures.ca – Canadian Railway Photography – photographie ferroviaire Canadienne. Caption: The cold autumn wind is blowing hard, while in the distance the orange autumn colours are gradually being stripped off the trees, this though is not the only fading orange shades, as Goderich-Exeter road train rolls east past the GO Station at Mount Pleasant, with little over a month left, GW orange will be all but a memory here soon too. This is one location I haven't spent much time at over the years, but it offers a bit of a change of scenery as the train leaves the Halton Hills behind and enters the urban sprawl of Brampton. the signal beside me for now basically serves no purpose with a temporary stopper installed on the tracks, but in the future the third track will eventually reach all the way to Georgetown. Nice lighting and shot Marcus. Yes, it all will soon be history as reportedly CN will operate these trains under the cover of darkness. I’m guessing it doesn’t get used yet, but looks like there is a switch in the distance. Its called a portable derail Oh and that signal is definitely in service.